Notice that some of these cheap electric toothbrushes under 50 dollars do not have advanced features but still offer basic level features on a budget. Although the cost is far more than a manual toothbrush, you will enjoy the results of your investment. The Oral B Black 1000 power rechargeable electric toothbrush eliminates more plaque from under your gums and on the gum-line by 300% when compared to the ordinary manual toothbrush. It employs the scientifically tested and proven Oral B 3D superior cleaning that rotates, pulsates and oscillates at an angle to remove more plaque than ordinary toothbrushes. It has a pressure sensor to alert you when you are brushing too hard. The Oral B 1000 has a dentist inspired CrossAction brush head that encircles each tooth with bristles positioned at a 16-degree angle while rotating pulsating and oscillating. The overall effect is that the 3D cleaning technique is very efficient at removing plaque even those hidden under crevices and under the gumline. 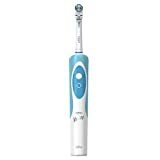 Check it out, it one of the few quality inexpensive best value for money electric toothbrush. The Oral-B vitality dual clean electric toothbrush is the cheapest Oral B electric toothbrush that accompanies a charger that you can leave the brush on, and an extra brush head. It costs around $25 roughly. It is arguably the best price electric toothbrush in USA market. This Oral B specially designed toothbrush called “Ortho” has the ability to clean the base of your teeth plaque builds. It can also clean braces. Operates on the Oral B 3D angled cleaning that covers tooth by tooth for best possible cleaning. The Oral B Vitality has a two minutes timer that aids you in cleaning for the dentist recommended brushing duration for efficient cleaning. It charges through magnetic induction and like most Oral B brushes, the charge lasts between 7-10 days on a single charge. It has relatively slower speeds than trademark top Oral B 3D rotary toothbrushes. It oscillates at 7600 strokes per minute compared to high-end Oral B power brushes that oscillate at 8800 and do up to 40,000 pulsations per minute. However, it is quite effective for cleaning teeth and removing plaque. It is also recommended for cleaning braces. The Philips Sonicare Essence 5600 Rechargeable Electric Toothbrush is more or less the same cost as the Oral B Vitality. It is calmer than the Oral B Vitality. It employs patented sonic innovation to tenderly remove plaque in difficult-to-reach regions. It has a smart timer to enable you to hit the two minutes brushing recommended by dentists. Its bristles fade away when the brush head is due for replacement. The Philips Sonicare Essence 5600 Rechargeable Electric Toothbrush has an easy start mode that gradually pumps up the sonic oscillations slowly as you get used to the sonic experience of multiple strokes per minute. It comes in two colors; pink and blue/white. It is also sold as a twin pack for couples or twins. The Philips Essence is the best selling toothbrush in the budget/cheap electric toothbrush category. Here is why. When it comes to basic “no frills” tooth cleaning, the Philips Essence give you the same efficiency as top end toothbrushes like Sonicare DiamondClean. This is because it runs on the patented sonic teeth cleaning technology that makes up to 30,000 strokes per minute. 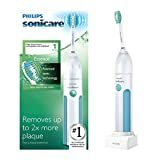 The only difference between top end Sonicare toothbrushes and the Philips Sonicare Essence is that the Essence runs on the basic cleaning mode of Daily Clean while to the top end versions give you more functionality, like 3-5 cleaning modes (clean, gum care,white, sensitive and polish mode. ), USB charging, travel case and more “frills and bells”. The price of Sonicare Essence is right and will give you value for money, as it is also durable. It is probably the best inexpensive electric toothbrush. It comes with two charger bases, 2 handles, and 2 travel cases. Electric toothbrush was not famous in the past, but their craze and importance are increasing day by day. An electric toothbrush can improve your oral hygiene and health. Although this type of brush performs the same duties that a disposable toothbrush does, it works effectively and does not require energy. This gadget has a rechargeable handle and oscillating brush heads that can be replaced every three to six months. Nowadays, there are so many oral care products roaming the market than years ago. This makes it tough to decide which one is worth buying. As dentists consistently insist on the importance of oral hygiene, most consumers may not be aware that the majority of these medical practitioners recommend electric toothbrushes over the manual hand brushes. However, in this electric toothbrush buying guide, you can find out all about the various types worth investing in. It’s true that we cannot hit every tooth or brush long enough. That’s where the power assist comes in handy. Usually, when you brush by hand, you make about 400 strokes per minute. Electric brushes rotate 3,000 to 8,000 times in a minute. It clears plaque in a more quick and effective way. Alternatively, you can opt for sonic brushes that make 20,000 to 30000 strokes per minute. Another advantage is that unlike the battery-powered toothbrushes that use AA battery, electric toothbrushes are rechargeable. They allow the user to change heads every three to six months. Additionally, the heads come in different shapes and sizes and work differently. Electric toothbrushes also have great features that will leave you mesmerized. For instance, some of these brushes have apps that sync with your smartphone and track your brushing habits. Alternatively, you can listen to music using your brush with the help of Brush DJ apps that play music from your iPhone. These apps can also provide oral care tips for people intending to learn. Although they all serve the same purpose, rechargeable toothbrushes come in various designs. Depending on the one that you choose primarily comes down to personal preference and comfort. Bristle Variety and Aesthetic appeal: Just like the conventional toothbrush, the electrical ones also have different bristle textures and shapes. Like earlier said, customer preference is key to ultimate comfort. Go for the brush that you feel comfortable to use. Why consider the bristle variety? Here is why most of the doctors recommend a soft bristle head in case you have sensitive teeth or gums. Alternatively, some believe the medium is always the best in removing plaque. Brushing Modes: Ensure that you take the time to choosing your brush. It is always prudent to buy a brush that offers different speed levels of pressure. Normally, best brushes have an option to create a customized mode that is ideal for the user. Battery life and charging abilities: The best cheap electric toothbrush 2018power-up quickly. One can charge them and get to use them severally before the power elapses. You will require approximately 12hours to recharge your brush. Ergonomic Grip Best electrical toothbrushes have a soft grip which makes them more comfy to use and handle. In case you don’t like the feel of vibrations, you might consider going for soft-grip handles that lessen the vibrations while brushing. Pressure sensors: Harsh scrubbing to remove plaque can do you more harm than good. You can opt to go for brushes that have pressure sensors. Some produce a beeping sound when you press too hard while others will automatically stop pulsing. After considering preference and lifestyle, buyers can decide what features are most important. There are several brands on the market that offer almost all the characteristics named above. In most cases, more features mean a higher price tag for the brush. In case you want a high-end model brush with several features, it’s important to make a few comparisons before making choices. What exactly is the difference between premium top end toothbrushes and cheap budget options? the thing that separates top end and best electric toothbrush under 50 is the level of functionality. High-end toothbrushes have different customization features like whitening, settings for sensitive teeth, tongue cleaner, Bluetooth pairing and the list goes on. All these features enhance your teeth cleaning sessions. However, if you are only interested in getting your teeth cleaned with a power toothbrush then and decent cheap best power toothbrush will do. Any good affordable electric toothbrush will do the job seven times better than a manual toothbrush. It will also help you brush for the dentist recommended two minutes. In this case, any best electric toothbrush under $50 that is rechargeable will improve the way you brush your teeth and lead to better oral hygiene.